What? Not enough NECA news today? Well lucky for you then as they have just announced the first in their quarter scale Marvel line: The Avengers Movie Captain America. That’s right if you ever wanted eighteen whole inches of Chris Evans you are in serious luck. Captain America looks to be slated for a December 2012 release, and put you back around $80. 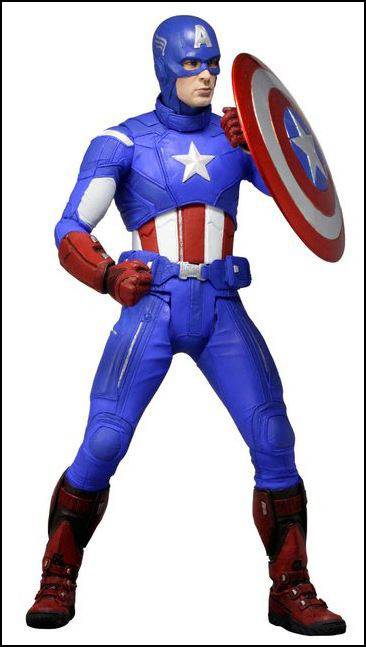 Captain America 1/4 Scale figure will be limited to 7,500 pieces. He boasts over 25 points of articulation and will include his trademark shield. NECA has additional movie Avengers planned, but will also be doing comic characters as well. We’ll keep you updated as news comes in.